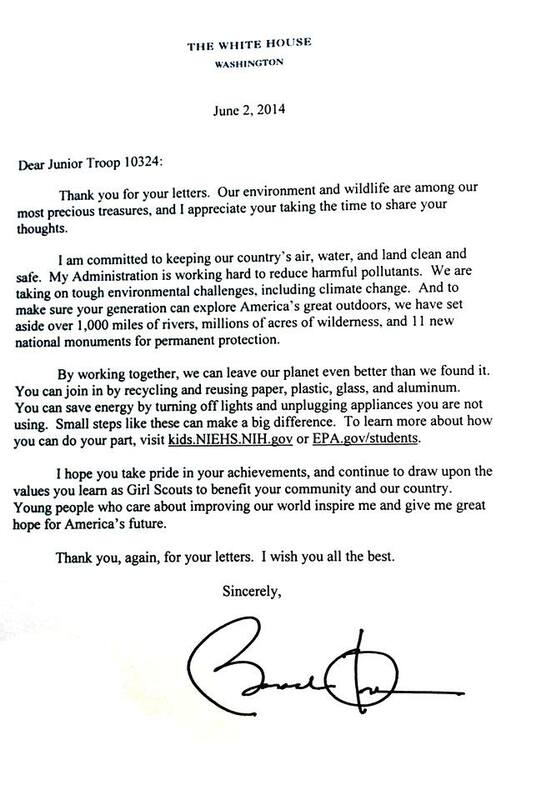 Earlier this month, troop 10324 from Baltimore County received special recognition from President Barack Obama and a feature in Save the Bay Magazine following their efforts to gain support for the clean-up the Chesapeake Bay. As part of their Junior Agent of Change Journey, the troop of seven reached out to each of the 21 state attorneys general who have joined the lawsuit that, if successful, would derail Chesapeake Bay clean-up efforts. While working on their journey and researching service opportunities, the girls discovered that there are 21states opposing the efforts of the six Chesapeake Bay watershed states and how they felt it was unfair. They discussed what they could do and decided to write a letter to each state stating their opinion and requesting that they not proceed with their opposition. Through several drafting and editing sessions the letter was completed, signed and mailed to the 21 states with copies sent to the President because of his Executive Order for Chesapeake Bay restoration, Mrs. Obama as Honorary President of Girl Scouts, our Governor Mr. O’Malley for his support of restoration efforts and Mr. William Baker, President of Chesapeake Bay Foundation. Through their research on the Chesapeake Bay Foundation website the troop learned about special interest groups, the role of a State Attorney General and why the 21 they were writing to started the litigation. They also learned how pollution runs off the land and into the bay’s waterways and into the bay as well as how reducing pollutants through better use of fertilizer and water treatment reducing pollutants in the waterways will help meet restoration goals for 2025. Way to go girls! Check out the letter from the President and their page from Save the Bay Magazine below!